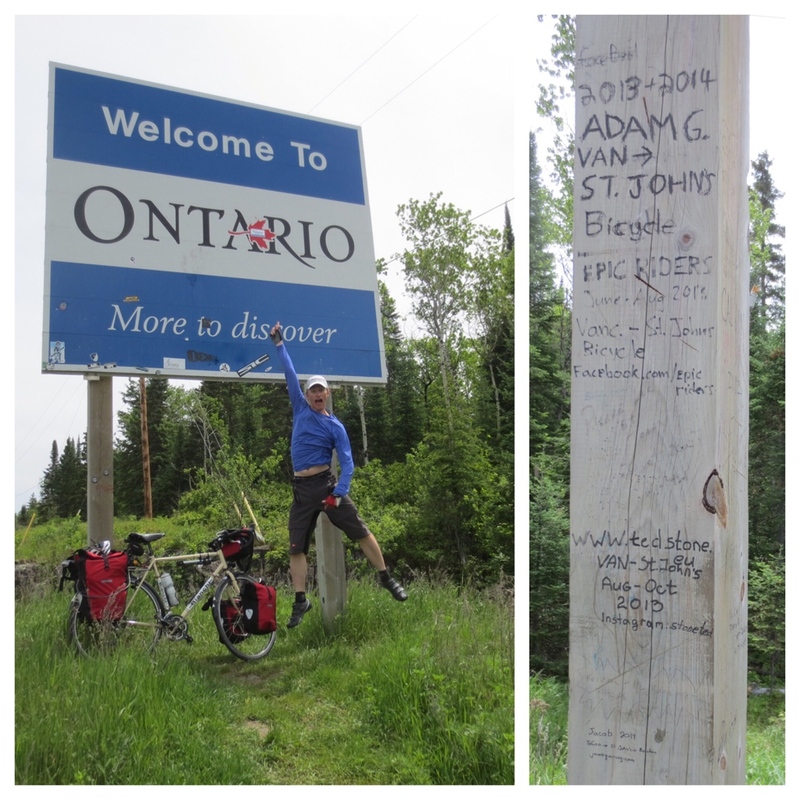 I completed another province and entered the behemoth that is norther Ontario. It could easily swallow a couple of other provinces, especially those in the maritimes, and still have room for dessert…maybe making eyes at a few New England states. I’ve mentally begun breaking up the next few weeks into more manageable destinations I want to reach. The next node is Thunder Bay. Getting to Kenora was my motivation for today as I recalled it being a lovely vacation town nestled among the lakes. Little things keep you going. On the way I most certainly entered the Canadian Shield as the hills and lakes now come thick and fierce. As for the inukshuks, no photo worthy ones yet but I promise some in the near future. After a week’s break, getting back in the saddle requires some determination particularly when the road ahead lacks in the excitement department. I am heading into the Canadian Shield, which many people find very beautiful so I assume exciting, but I confess my ambivalence. I used to take the bus from southwestern Ontario to university which ran along the route I’m cycling now. I recall scenic sections around Lake Superior but the towns are so far apart and the Shield goes on and on. It will probably take me a couple of weeks to traverse. 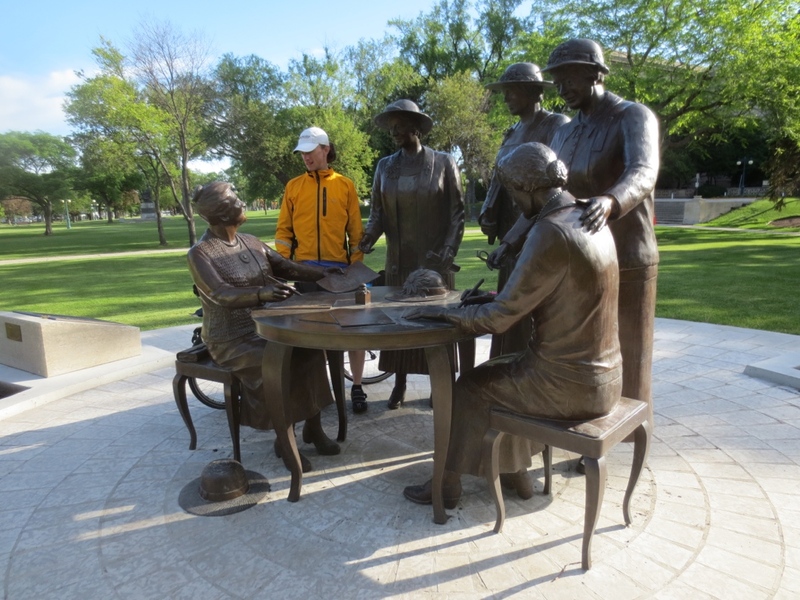 Conversing with Nellie McClung and the other women who fought to make Manitoba the first province where women had the right to vote. As I push further east, the French influences and settlements are becoming more apparent with names like Notre-Dame-de-Lourdes, Portage La Prairie, or St Claude. Officially Canada is bilingual but the frequency of bilingual signs noticeably increased the last few days. French Catholic and later French Métis communities were very important to what became the province of Manitoba. Louis Riel, rebel, politician, and founder of the province, being the most obvious example. The noticeably change in signage wasn’t in official road signs alone but local advertising and information. Coming into St Claude the sign for a dairy museum especially intrigued me. As in many other cases, it opens later in the season. 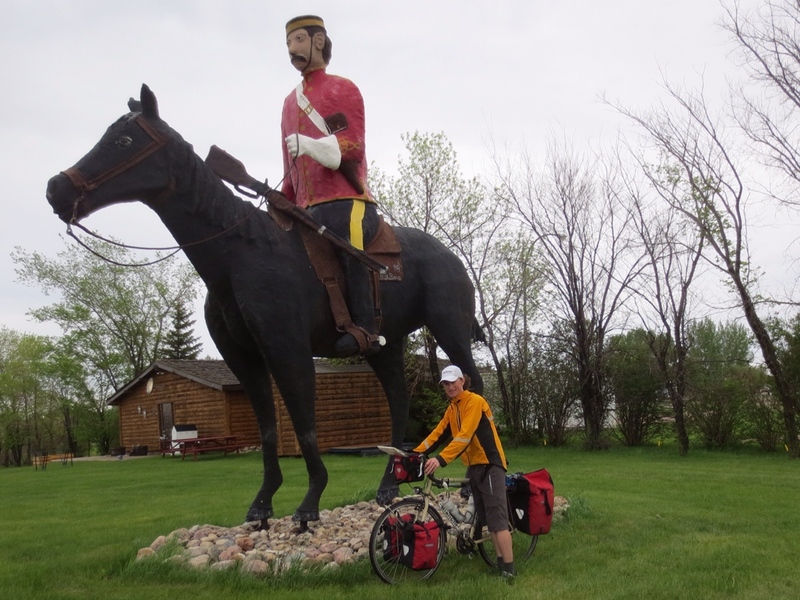 My compensation for turning off the highway was another town statue attempting to encapsulate the local history. St Claude harkens back to a town of the same name in France known for producing tobacco pipes. A web search suggests the original St Claude has their own pipe statue, maybe more appropriately so. There was no indication St Claude, MB ever followed in the profession of its namesake. I didn’t have a chance to talk to any locals so not sure how bilingual the people were; the bilingual signage on everything from schools to stop signs could have been either an indictment or reflection of local culture. 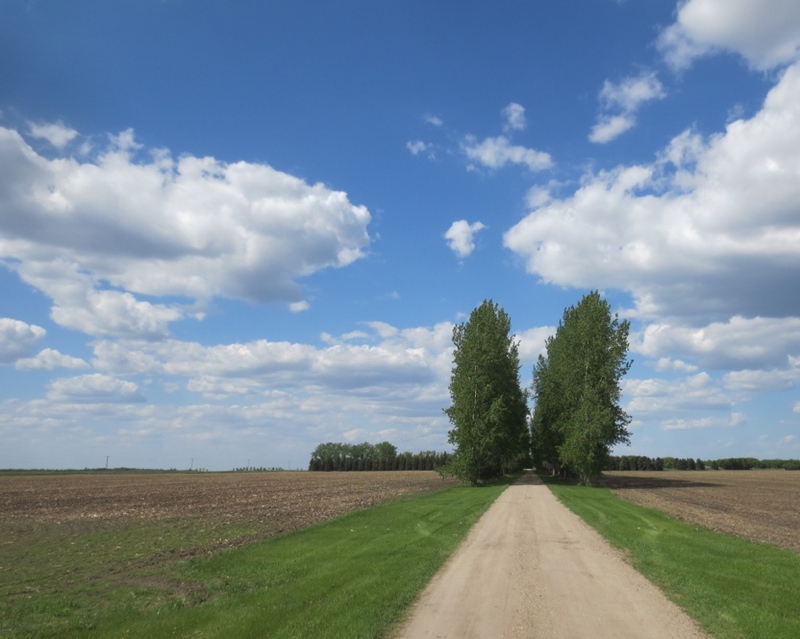 On my first encounter with the prairies, it seemed a despondent and lonely place as far as I could tell. With so much space and apparent emptiness between everything, I could only imagine everyone longingly looking towards the city for comfort, connection, and belonging. 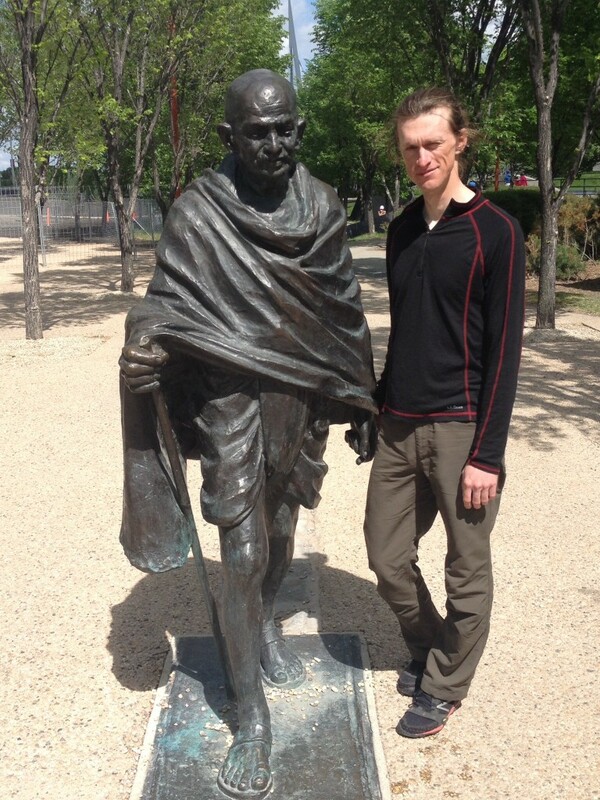 I came to the prairies for university and so my first time on my own. A good deal of my perceptions were most definitely good old transference. Nevertheless, I required a few years to appreciate the beauty and vitality where I thought none could exist. No longer did it seem self evident or even likely that people in the prairies would feel any yearning for the city. 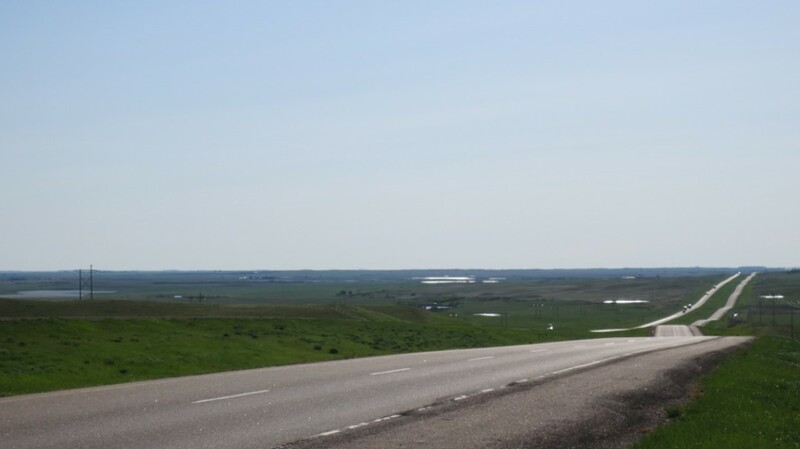 Happiness is relenting winds, glimpses of the sun after a few days of wet and overcast skies, crossing another provincial border, making it out of the oilfields to pasturelands and wheat fields. Happiness is the realization that it takes very little to feel like you’re cycling on top of the the world again. Today was a day for happiness. Usually I write about the interesting places I encountered or the lovely lanscapes I’m rolling through. As a whole my portrayal has been fairly upbeat, which isn’t simply presentation but reflects my experiences. Of course challenging days invariably come but challenging is different than miserable. Miserable describes today fully. If I were to say it was a day requiring exceptional pedaling technique, I think you would get my drift. (Hint: wind, wind, inexhaustible wind!) That little gift of the prairies compounded with chilly, overcast, and wet conditions left very little to get excited by. Unfortunately, the scenery was no more inspiring as I travelled through oil fields all day and ever so slowly. 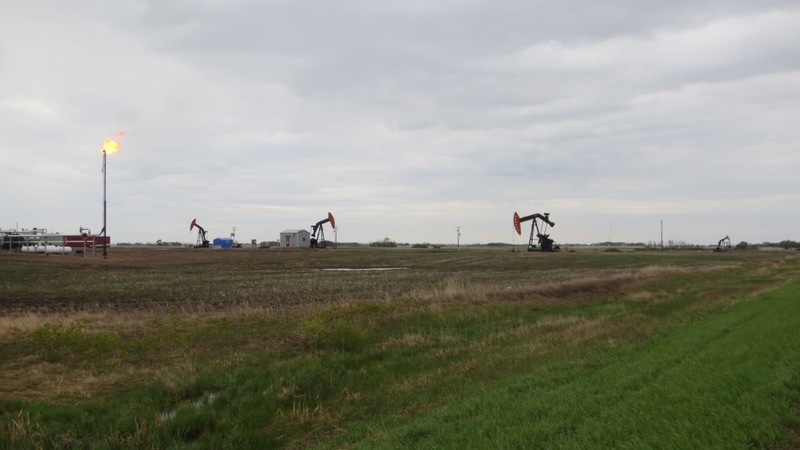 I’m not sure if it’s simply the association of oil with the derogation of the environment but oil fields are depressing. What a change from the wheat fields of yesterday. The road starts to become unending and the little towns so far apart and the wind is all you can think about. But battle I did and persevered. I now understand why the grain elevator is so indelibly imprinted on the psyche of the prairies. Most obviously is the economic importance it played in agricultural communities and wheat farmers but they are more than places to store grain. 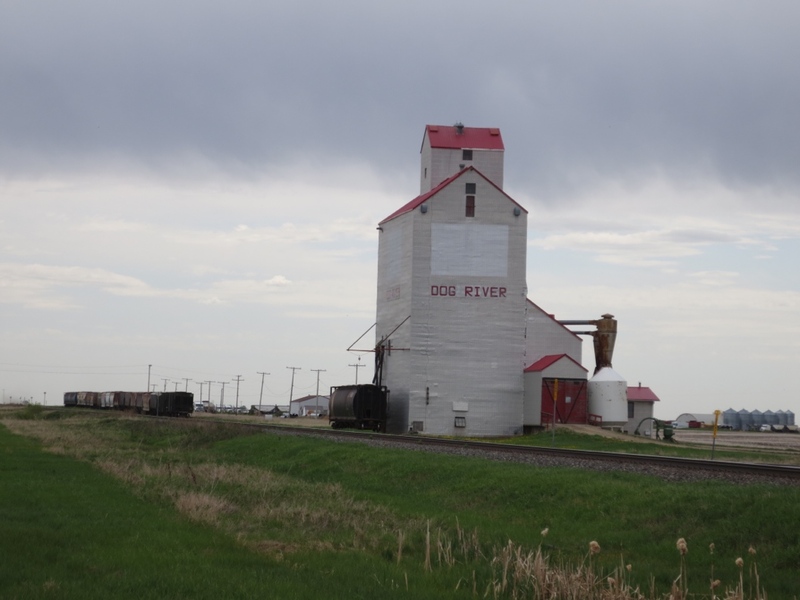 Grain elevators dominate the landscape and tower over the towns. The businesses and watering holes sprang up across the street from them. I can only imagine the rich life that conspired in their shadows-the exhilaration and despair of rising and falling wheat prices, gossip shared about so-and-so’s latest scandal, world affairs discussed and solved, and surely more than a few furtive romances. 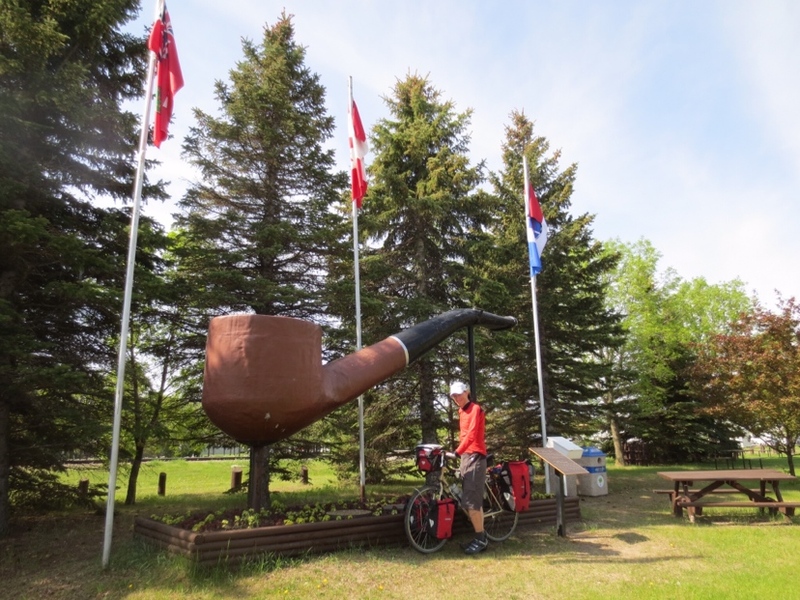 Cycling across the country assumes some unity or meaningful connection exists between the many and varied places I come across. And as we come to July 1 in a month’s time, there will be great celebration of this land we call Canada. While I don’t want to deny the many worthy celebrations, I’m also trying to leave myself open to seeing the wounds across which we are stitched together. Today I visited the tunnels of Moose Jaw. It was one of those days you feel ashamed about the atrocities and discriminations of the past not with judgement, thought we cannot excuse our past, but with a realization for how easily our prejudices can be visited on the ‘other’ and the cost of that power. The legacy of Mennonite settlers from yesterday and the treatment of Chinese immigrants today created a sharp contrast highlighting the irrationality and devastation of prejudice against one people for their racial, ethnic, or cultural origins while another is welcomed and supported. Mennonites were welcomed farmers praised for their industry; Chinese immigrants were despised and every effort was made to make them disappear despite their hard work and sacrifices.